CHAK89 can bring its unique atmosphere to your chosen venue be it a location listed in our venue selector, a marquee or even your own home. Our experienced team of outside hospitality and catering staff aim to provide you with a convenient and stress-free service so you can concentrate on yourself and your guests. Providing our high-quality restaurant food in a location of your choice, we can ensure our professional and personal service will be key to a successful event. With this service we can provide everything from a buffet or silver service, a three-course menu, uniformed waiters, a licensed bar, entertainment and much more. CHAK89 head Chef, Mr.Nasir with top Bollywood actor and star Akshay Kumar. Also seen in the picture is the Director of CHAK89 and Elbrook Cash and Carry Mr. Frank Khalid. 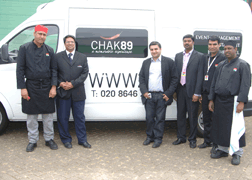 Akshay Kumar was ably guided by CHAK89's head chef for the role of a Cook in a commercial soon to be aired on Star TV. The CHAK89 Team with Bollywood Star and Top notch actor Akshay Kumar at HDS Studios, Hayes where CHAK89 catered for the Star during his shoot for a commercial soon to be aired on STAR TV. Akshay Kumar insisted to have his lunch prepared and served by CHAK89 during the Shoot. The Star was served Sushi among other dishes. The Star who is highly conscious of his diet on location was served Sushi for lunch. He was also served freshly prepared variety of Salads and Fruits - specially prepared by CHAK89's highly experienced Chefs.